if you are just looking for the gistthat bootstrap code for this, it's here. I first started to think about this problem when I found myself having to tailor workbooks for particular capabilities described on this site. I'm not great a fan of add-ins (for libraries), and I wanted to find a way of making the code openly available, and at the same create a general capability for people to share and update VBA code painlessly, either publicly, or between their own workbooks. In the end I decided to use Gists on GitHub. Here's how it works. Install some bootstrap code in your VBA project. This will automagically bring in the code mentioned in the manifest to your project, and make updates on demand. The code for that is here. Here's a Step by step module updating example using the Automatic documentation module, and here's a post from the Excel Liberation blog with an even simpler example. I'm building up a list of how to get various combinations of modules into your workbook here. The cDataSet and cJobject family of classes are the most widely used on this site, but I often get questions about which modules are needed to do some function or other, and then when there are updates there is no way to push them out to people who have already incorporated them in their workbooks. This gistThat capability provides it. 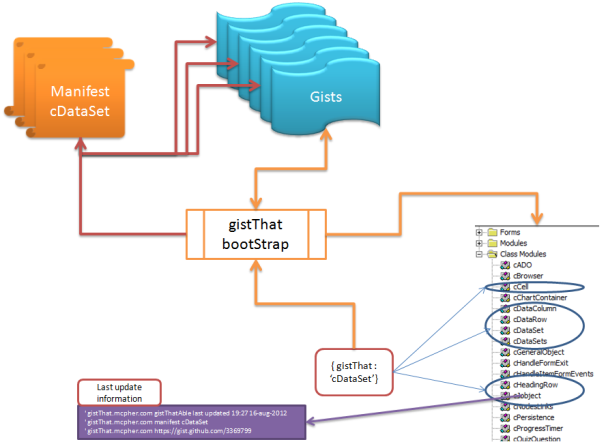 Once you have created a module containing the gistThat bootStrap code, your workbook is ready to incorporate any code that is stored as a Gist on github and has been described in a manifest, itself an XML Gist. An example work book , gistThat.xlsm is included in the downloads section. be sure that you trust the source and the purpose of the code. This is no different than downloading any workbook from a public place, but in this case your project code is going to be updated in situ. Chip Pearson has the definitive writeup on updating code programatically, and this is exactly what the gistThat bootstrap does. To allow access to your project, you need to set this option in the Excel trust center. You'll now have all the modules and classes required for cJobject and cDataSet. Run a virus scan on your workbook to reassure yourself you have followed these steps and not picked up any malware. You can of course create your own manifests. This will allow you to share( and keep up to date) useful modules with others and between your own workbooks. Simply load your code to one or more gists, and follow the instructions for including the bootstrap code in your worksheet and modify the example given for cDataSet (cDataSet is very complex involving many classes and modules). gtAddToManifest dom, "3414216", "class", "cCell", "cCell.cls"
gtAddToManifest dom, "3414216", "class", "cDataSet", "cDataSet.cls"
gtAddToManifest dom, "3414216", "class", "cDataSets", "cDataSets.cls"
gtAddToManifest dom, "3414216", "class", "cDataColumn", "cDataColumn.cls"
gtAddToManifest dom, "3414216", "class", "cDataRow", "cDataRow.cls"
gtAddToManifest dom, "3414216", "class", "cHeadingRow", "cHeadingRow.cls"
gtAddToManifest dom, "3414346", "module", "usefulStuff"
gtAddToManifest dom, "3414365", "class", "cJobject"
gtAddToManifest dom, "3414615", "module", "usefulColorStuff"
gtAddToManifest dom, "3414836", "module", "regXLib", "regXLib.vba"
gtAddToManifest dom, "3414836", "class", "cregXLib", "cregXLib.cls"
You can also add required references to the manifest. The code below will add any references in the current project to the manifest being built.